Scottish Hockey would like to wish Megan Cunningham, Scottish Hockey Office Administrator, good luck as she takes a six-month sabbatical to train full time with Scotland’s women’s football team as part of preparations for the 2019 FIFA Women’s World Cup in France this summer – Scotland’s first ever appearance at the tournament. The Indoor Gala Day 2019 this weekend will be Megan’s last day before setting off for full time training. 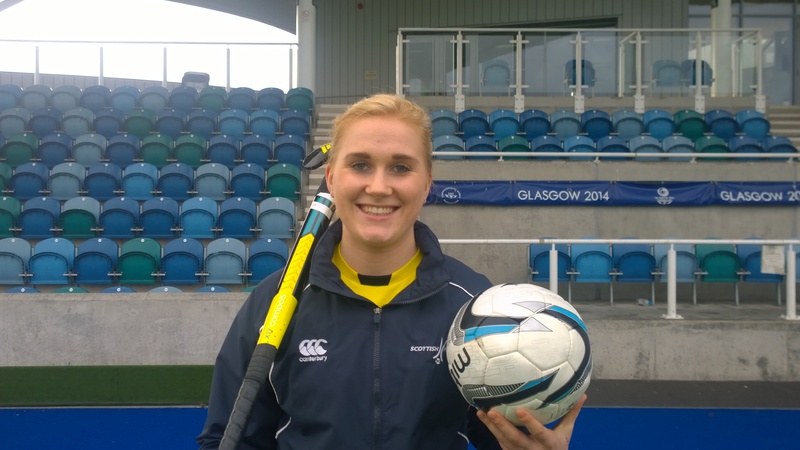 Megan, goalkeeper for Celtic and Scotland, joined Scottish Hockey in 2017 and has been a valuable, committed and enthusiastic member of the Scottish Hockey team. Everyone at Scottish Hockey is delighted that Megan has been selected in Scotland’s squad for full time training for a second time, following selection ahead of the UEFA Euro 2017 finals. We wish Megan well for the experience, her bid for selection for the tournament, and we’re all looking forward to supporting the Scotland squad again in the summer. Scottish Hockey CEO David Sweetman said, “We have seen first-hand the hard work Megan has put in to return to fitness following an injury set back, and are delighted that this has been recognised in a call up to the Scotland full time squad. Megan said, “I’m really surprised, and of course honoured, to be one of home-based players selected for the World Cup full-time training programme. This makes such a huge difference with the intense training load, and really helps create a professional lifestyle to allow us the best chance of selection and prep for the World Cup in the summer.